Thank you to our lovely friends Gina (pictured below) and Maddie for inspiring a delicious dinner! We decided to each prepare a dish from a country that we’ve lived in. Maddie brought her favorite Ecuadorian bread, Dave and I made the Spanish calamares a la romana as seen in the previous post and Gina showed us how to make a Chilean tortilla, a staple of her diet when she lived in South America. Grate the carrots and fry them for a bit in the oil and sugar so that the flavor comes out. When they start to soften put them in a large bowl and mix in the eggs, flour and salt. Pour the oil into a pan and wait until its hot, thus ensuring that the mixture won’t stick to the pan. Pour the mixture into the frying pan and basically follow the same directions as written in our previous post about tortilla espanola. 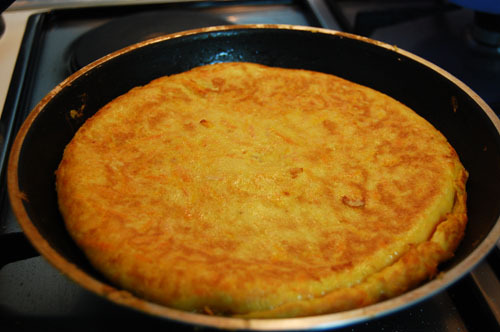 You’ll have to flip this tortilla so you’ll need a big plate, strong arms and some courage! When the tortilla is cooked through (not too runny or soggy in the middle), serve on a plate. Thanks again to our friends for expanding our blog and our stomachs with food they hold dear to their hearts.